Bajaj Auto's net profit rose 15.6 per cent in the quarter ended December 2018 as against Rs 952.44 crore a year ago, driven by robust sales of motorcycles and commercial vehicles. Even as the increase for the fifth straight quarter surpassed estimates, the margins disappointed. 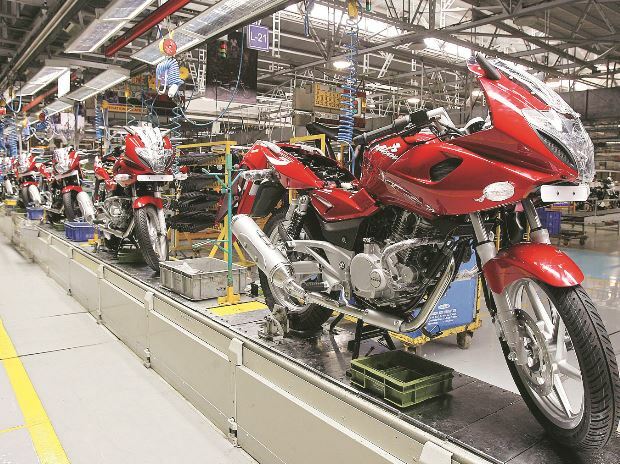 The maker of Pulsar and Discover motorcycles reported a net profit of Rs 1,102 crore in the three months ended December against Rs 952.44 crore a year earlier. That compares with Rs1,047 crore that analysts surveyed by Bloomberg had forecast. Led by higher volumes, revenue at the Pune-based firm rose 16 per cent to Rs 7,409 crore over Rs 6,387 crore a year ago. Bajaj's overall volumes including commercial vehicles and exports jumped 26 per cent to 12,59,828 units over the same period a year ago. However, the gains came at the cost of operational performance, which lagged estimates. Operating income or earnings before interest, tax, depreciation and amortisation fell 7 per cent on a yearly basis to Rs 1,156 crore while the estimate was Rs 1,203 crore. The company's operating margin contracted to 15.6 per cent during the period from 19.5 per cent. Analysts had forecast 16.1 per cent. The operating margins were the lowest since September 2014. Analysts were disappointed by the steep contraction in the margin and attributed it to the company chasing volumes and market share gains over profitability. During the festive season, Bajaj was very aggressive in discounts and sales promotions, and this has weighed on the margins, said Nitesh Sharma, an analyst at Phillip Capital. Sharma expects the profitability to continue taking a hit as two-wheeler sales have slowed down in the last few months. If anything, the switch to stricter legislation on safety and emission that takes effect from fiscal 2019-20, will mount further pressure. Rakesh Sharma, chief commercial officer at Bajaj Auto is not worried. "We are not concerned. In fact, we are happy we have gained four percentage points in the domestic motorcycle business," he said. Company's share in the segment has increased to 20 per cent in the December quarter. It was 18 per cent in the September quarter and 16 per cent in the June quarter. The company has gained 5 percentage point in each entry-level and sports segment. "It is very short-sighted to say management has lost focus on bottom line, said Sharma. He pointed out that the margins have not fallen because of operational reasons, but because of the higher contribution of Africa where the company sells cheaper bikes and because of unfavourable hedging position of the rupee. Company's realization per $ was Rs 68.9 in Q3/ FY19 as against Rs 69.4 in Q2/ FY19 and Rs 66.9 in Q3/ FY18. Despite higher sales and promotions during the quarter, the margin drop quarter-on-quarter is only by a decimal point as it was helped by a better product mix. It has come off in the international business by a couple of percentage points, he said. Sharma cited a higher contribution of Africa in the overall international business to be another reason for the dent in the margins. The region saw a growth of over 60 per cent for the company which led to the share in the overall exports from Africa increase to 45 per cent during the quarter from 38 per cent a year ago, said Sharma. We see the exchange rate impact swinging in our favour and new product introduction to play out by March or April, said Sharma. Bajaj Auto's shares closed at Rs 2,498.85 a piece on the BSE, down 2.65 per cent. The Sensex closed at 35,591.25 points, down 1.25 per cent.